JACKIE LOMAX was in The UNDERTAKERS in the early 60’s and in 1966 BRIAN EPSTEIN signed him as a solo artist and following Epstein’s death was the first solo artist signed to the BEATLES’ new label APPLE for whom he recorded three singles and the LP “Is This What You Want” with contributions from Paul, George Ringo, Clapton and others. In the ’70s Jackie moved to the USA and signed with Capitol Records following which he appeared on a number of albums for other artists until 2001 when he recorded his first solo album since 1977 “The Ballad of Liverpool Slim”. Over recent years Jackie had continued to play live his “blues to soul” and he has recorded eleven new Lomax songs which mine deep those genres and showcase his wonderful voice and guitar playing on this album. 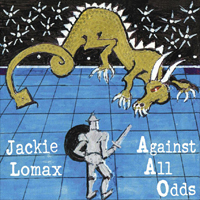 Jackie died on 15th September 2013 in the Wirral, Merseyside and he recorded shortly before his death “Against All Odds” which is a fitting finale and a welcome addition to his musical legacy. It's a pity Jackie Lomax is no longer with us to provide more of this wonderful music. But if this is what he left to be remembered for? Its a worthy closing musical statement. Tracks like the love song 'Against All Odds', the reflective 'I Must Be Doing Something Right' and the nostalgic 'When We Were Young' all showcase his superb, emotive voice which is undiminished by his 69 years. His guitar playing is as bluesy as they come and is testament to Jackie's expertise with the instrument...This album is a suitable epitaph for one of music's great characters. This album is nothing if not heartfelt and deserves to be heard by anyone, Beatles' fan or not, previously touched by Lomax's music.